Annual conference at the Southwest College of Naturopthic Medicine in Tempe, Arizona. Topics include managing acute/chronic pain, therapies for musculo-skeletal spasm, osteoporosis, fibromyalgia, trophorestoratives, herbs for healthy aging, and much more. 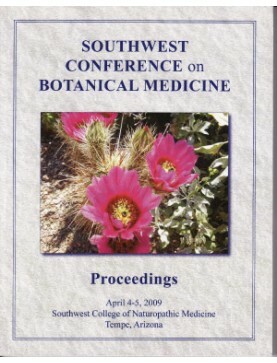 2009 Southwest Conference on Botanical Medicine: Conference Book. Order download of PDF f..
Speaker: Deborah Frances. Ceanothus: Our Western Spleen and Liver Tonic..
Speaker: Deborah Frances. Plantain, Yarrow, Calendula & Arnica:..
Speaker: Deborah Frances. Herbs for Musculoskeletal Spasm, Sciatica, Nerve Impingement..